TaylorMade is one of those distinguished brands that never stops improving on what’s already great. The 2016 version of the M2 was rolled out to a huge fanfare. But it wasn’t absolutely free of flaws. The 2017 M2 isn’t free of glitches either. However, it made its way to the golf kits of high-profile players like Justin Rose, Rory, and Sergio Garcia, speaking volumes of the product’s credibility. The 2017 M2 looks sturdy and massive but not overwhelmingly bulky. Some more useful updates include a 7% larger face, adjustable hosel, reengineered Speed Pocket, and an enhanced weight redistribution. But how do all these upgrades fare in reality? Is the 2017 M2 really worth switching to or all these “upgrades” are nothing but a mere marketing gimmick? Let’s try to find out the answer. isn’t best suited for golf players with moderate to high handicaps. Packs a potent mix of good distance coverage and forgiveness. Thanks to its 7% larger face, the head of M2 boasts of a larger footprint. The unique geometric shape and stiffened body helps to reduce vibration and simulates a muted carbon sound. Clever weight distribution. 25g of its mass is distributed at the low and back of the sole to increase MOI. Slim, aluminum adjustable hosels make it easy for fitters to fiddle with the shafts. The weight-saving geometry of the driver drastically lowers the CG. The 2017 M2 shares a number of similar features with its predecessor. The most prominent design upgrade in the 2017 lineup is the weight-saving head and re-engineered sole. This model’s sole is sculpted from a thinner 9-1-1 titanium paired with a crown composed of 6 layers of carbon composite. Read our in depth guide about golf drivers 2019. The narrow shape of the titanium ledge makes the crown appear larger and greatly helps with the mass relocation.(source). These two also give the driver its distinct and minimalistic black and white profile. The sole features tinges of neon yellow which further adds to the aesthetics. The circular silver weight also stands out and overall, the sole of M2 (which TaylorMade fondly named Geoacoustic) looks quite well-fitted. The Speed Pocket of the 2017 lineup is nearly 3 times more flexible than its predecessor, a significant addition that helps to gain ball speed. After all, for a dedicated club golfer, it’s all about the speed at the end of the day. It lowers the mass by 25g and then redistributes it in the lower and back part of the sole. This not only drastically reduces the CG but also sends the MOI higher at a whopping 5000 g/cm2. This also makes your gear easy to groove and exceptionally forgiving to mishits. A classic shot off the face produces a satisfying firm sound, assuring you that you have hit the ball correctly. The credit goes to the sunken sole curvature that enhances the stiffness of the body, thus minimizing vibrations.(source). This means there is less sound on the internal ribs of the head and so, a lot of weight is saved to be further relocated elsewhere. ​The manufacturer was humble enough to render this as “the breakthrough in acoustical engineering” and I cannot agree more. The M2 provides Loft Sleeve adjustability with 12 settings. This might not sound like a smashing deal for seasoned club players. However, if you are a newbie or intermediate golfer, you might want to look for a driver with no bells and whistles. Most panelists like to tinker with the lofting to receive more mileage. You can gain as much as 7 yards of carry distance with pretty much the same ball speed. However, toggling the hosel up by two notches affects the balance of the head. Since the fine-tuning options are limited, M1 might be a better option for some players’ swing. Nonetheless, which one will be the most befitting for you strictly depends on your skill set and specific requirements. Also, take the help of a TaylorMade Custom Fitter to get a better idea of which driver will be a perfect match for your game. 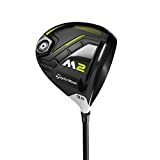 If your golfing demands more feedback, we would like you to check the TaylorMade M1 which has a more polished feel to it. While the M2 only provides the head loft option, you can fine-tune M1 a lot more to suit your needs and for achieving optimal results. This makes it a better choice for golfers who really like to up their game by fiddling with the adjustments. The weight redistribution, spinning rate, forgiveness, and materials used in both drivers are the same. However, the M2 has a stronger shaft which is primarily designed to be more forgiving to aid game improvement. This model features a bias draw head that can help you gain 10 yards of draw with 250 RPM ball speed. The draw of this model is thankfully not overwhelming and easily manageable. I think golfers who like to hit straight or draw bias drivers will benefit more from the D-type head than the 2017 M2’s head with 7% bigger face. ​The key difference between the M2 and M4 is the use of RIBCOR Technology in the latter model. It stiffens the head and offers a greater face flexing on impact. The positioning and weight of the RIBCOR bars make it 24% more forgiving than its M2 counterpart. RIBCOR bars along with the more curved and slim Speed Pockets and Fujikura's Atmos Red Graphite Shaft are much better at preserving the ball speed and straightening out your shots than the 2017 M2.